Your doctor has applied a cast or splint to stabilise the broken bone or injury. If your splint is removable, please follow your doctor’s instructions and only remove under your doctor’s instructions. If you have a cast, follow your doctor’s instructions when you can weight bear on the cast. Firbreglass casts dry quickly and its lighter in weight compare to plaster cast. A brace comes with a built-in air cushion and can be use right away. It is either made of hard or soft plastic and inflatable air pads. The plastic is fitted around the injured area and usually held in place with straps. The air pads are inflated to hold the injury firmly in place. Never cut or modify your cast or splint or use powder on the skin under the cast. Keep dirt and sand from getting into the cast. Your cast or splint may feel tight for a few days after your surgery or injury. This is usually due to swelling. You have elevate your arm or leg above your hear level to help to reduce the swelling. Sometimes, it’s good if you use a pillow to prop up the arm or leg when you lie down. Ice the arm or leg, however, keep the cast dry. You can put the ice in a plastic bag and wrap it in a towel and place it over the injured limb. You can’t move your fingers or toes. You have severe pain or increased pain that you think is from swelling, and your cast or splint feels too tight. Your hand or foot feels numb or tingles. You have a lot of swelling below your cast or splint. It is also important to keep up your muscle strength although you have an injury. You may need to exercise your fingers or toes to maintain the muscle strength while you still have the cast or splint on. Unless you have a fiberglass cast with a quick-drying lining or a brace with air pads, do not get your cast wet. If you have a removable splint, ask your doctor whether it’s okay to remove it to bathe. Even though the splint is removable, your doctor may want you to keep it on as much as possible. Keep your cast or splint covered with plastic when showering or taking a bath. Itchy skin is common under a cast. Blowing cool air from a hair dryer or fan into the cast may help. Never stick anything inside your cast to scratch the skin. Don’t use oils or lotions near your cast. Call your doctor if you think you have a skin infection. Call your doctor if you feel increasing pain in wearing your cast. 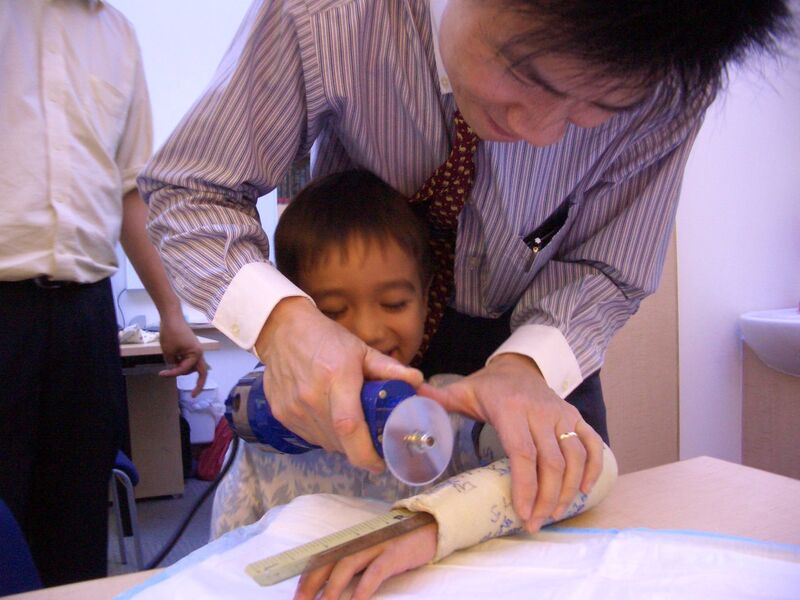 Call +65 6471 2674 to see our orthopaedic specialist regarding your cast or splint.